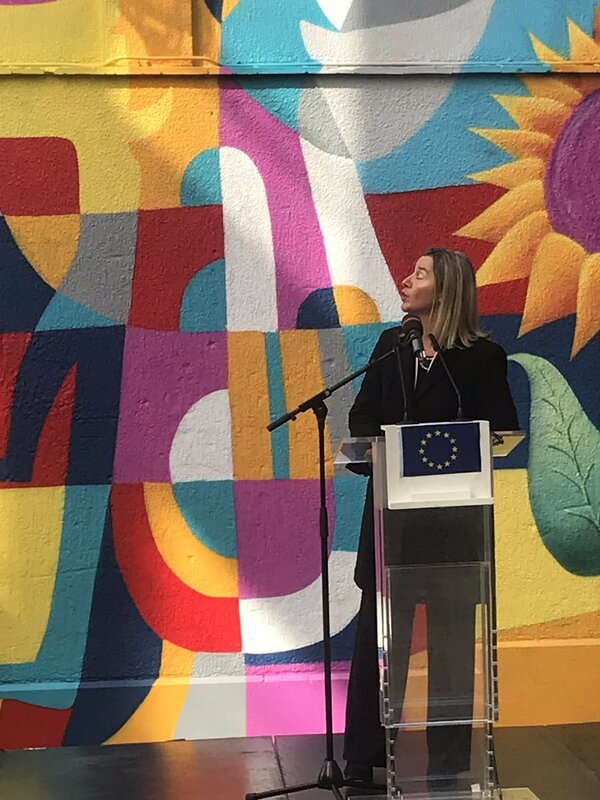 High Representative/Vice-President Federica Mogherini inaugurated a new mural in Brussels, painted by Rikardo Druškić, one of the most acclaimed young artists from Bosnia and Herzegovina. The mural is dedicated to the people from the Western Balkans and the EU and the deep cultural ties between them. Its title "It is only with the heart that one can see well" invites us to look at each other with open hearts and without prejudice. The creation of the mural was supported by the EU, the Balkan Trafik Festival and the City of Brussels. It will become part of the popular Brussels' Street Art Parcours. The EU - Western Balkans mural is part of an EU - Western Balkans Cultural week organised by the European External Action Service (EEAS) in Brussels to celebrate the shared European identity and strong cultural connection between the EU and the Western Balkans. It kicked off on 2 April in Bozar with performances by renowned musicians from the region, artists from the social media campaign "Europeans making a difference" and presentations of the Western Balkans cultural heritage projects supported by the EU.